It's that time of month where Library Luv's and mine monthly book tag! Click here to see the original post, here! So welcome to the 2016, LL & A's Monthly Book Tag! 1- What is one book that you want to read but doesn't come out for a while? I'd say, maybe . . . The Crown by Kiera Cass? I have been in love with the series and as the last book wasn't as AMAZING as the first three I have high expecations for the last book. And hoping it reaches my expectations! There are so many though, so many wonderful books coming out in 2016 and I probably won't read them all :( but I will try! 2- Which book that has been on your TBR for a year or more? This book has actually been on my TBR for about . . . two years? and I still have yet to read it! 3- What genre do you want to start reading more of? I already read almost all genre's but the MAIN genre I want to read more of is Contemporary/ contemporary fantasy. I need to have my fantast ;P but After reading To All The Boys I've Loved Before I have been in this Contemporary faze and I'm loving it! 4- If you could interview one author this year, who would you want it to be? Well, at the moment I am doing my event here on my blog "New Year, New Books, Author Interviews" and I have interviewed amazing authors already! and for most, I've read their books and I talk to most regularly on twitter! But if I could interview one author it would have to be the one who started it all CHANDA HAHN! I have all of her books (literally! except one but I'm ordering it soon and I've already read it) and I plan to read every book she writes because I love her series Unenchanted and the other fantasy series The Iron Butterfly. So, I would want to interview Chanda Hahn. 5- Which sequel that releases this year are you looking forward to the most? Sequel sequel sequel . . . I would have to say A Court Of Mist and Fiery because Tamlin and Feyre were just perfection. I can't wait to see what happens! 6- Who are two debut authors' that you can't wait to start reading books from? Kim savage, I really want to read her book, After the Woods! The cover is gorgeous, the description! the book! I need it! I want it! I NEEED it! 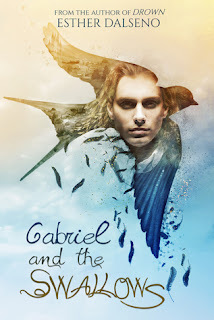 Esther Dalseno published her Debut novel back in October of 2015 and I loved her book, so a book I'm REALLY looking forward to reading is her novel "Gabriel and the Swallows" that is being published by ofTomes. 7- If you were allowed one ARC this year, what book would you choose? One ARC! *sweats nervously* I'm not ready! I'm not prepared! *deep breath* okay, I got this . . . I would choose . . . Anita Grace Howard's book that is coming out in while, Roseblood. 8- What was your favorite gift you received over the holidays? I personally liked everything I got. I got books, Harry Potter stuff, Chocolate, Clothes . . . but my favorite is a wand . . .
9- What is your favorite character from a book you've recently read and why are they your favorite? I am currently reading Fire Falling by Elise Kova and I am in LOVE with Vhalla and Aldrik! Need Earth's End . . .
and so so so so so so sad! 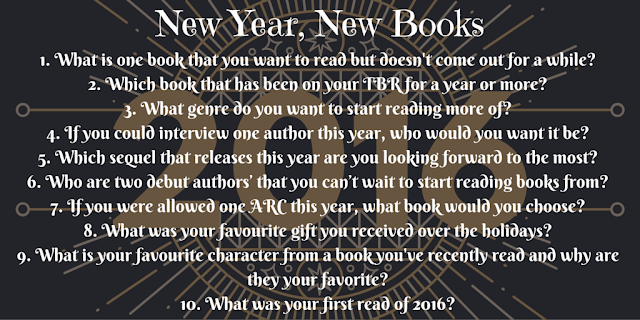 10- What was your FIRST read of 2016? anyways, the first book in the Elementals series! I am not sure if the book is out yet, if it is I highly recommend you read it . . . because Blake. That is all I'll say.